These days the majority of diets are consist of junk food that is highly acidic. As a result, more fat cells will be created to neutralize the body. This inevitably results in unwanted weight gain. Alkaline water helps to lose weight by naturally neutralized the acids in the body. The fat storage in the body is reduced by drinking alkaline water. A body that consumes alkaline, losses weight easier than a body with high acidic level. Alkaline water gives extra hydration to the body. There have been researches that have concluded that blood viscosity increase due to dehydration and cause some heart diseases like high blood pressure and arteriosclerosis. To keep cholesterol and sugar level balanced it is important to think sale and healthy alkaline water. There are studies that have shown that drinking alkaline water regularly would eventually improve cholesterol and sugar levels. People who have problems with high sugar and cholesterol can keep themselves healthy by consuming alkaline water and not just through medicines. With balanced pH levels in alkaline water, a human body can absorb all the minerals it gets from water and results to keep a heart healthy and safe. The research conducted at Colorado State University states that alkaline water hydrate better than regular drinking water. Alkaline water has smaller clusters that make it easier for the body to absorb. As compared to regular drinking water, alkaline water is way much effective for hydration of the body. Also, by drinking alkaline water, body neutralizes the effects of acid leading to better digestion. A better digestion leads to hydration. Toxins in our body cause many diseases and illness, a primary benefit of Alkaline water is that it helps to wash away various toxins from our body that comes through junk food and acidic food that we consume in our daily life. Alkaline water makes sure that water is free from harmful minerals and other impurities. Drinking 8-10 glasses of water in a day is a foundation of detoxification. Drinking plenty of water is a vital element to good health. Alkaline water contains loaded with minerals that are required for healthy strong bones like potassium, calcium, and magnesium. 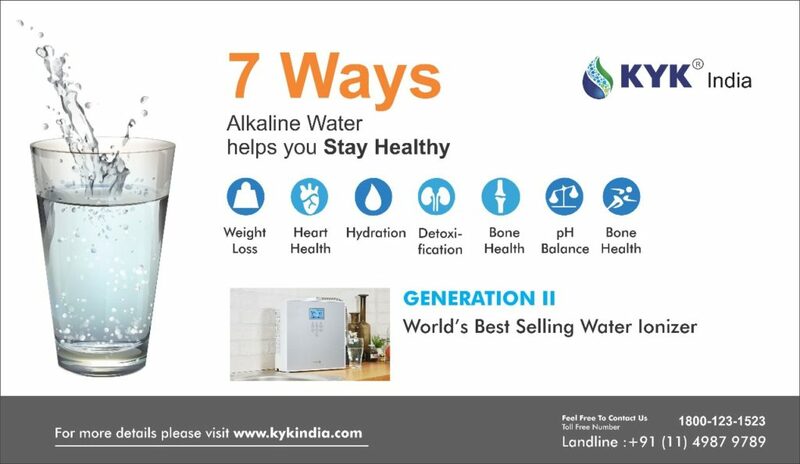 Excess of acidity in the body that increases bone loss, alkaline water has pH levels that help to prevent excess acidity in the body. Alkaline water also reduces the quantity of calcium that discharges through urine. alkaline water offers a risk-free way to maintain bone health. Many studies have the shower by drinking alkaline water bones can stay healthy. There are experts who say that pH balance is extremely important. Basically, pH stands for the power of hydrogen, which is a measurement of the hydrogen ion concentration in the body. The pH scale ranges from 1 to 14 in which 7 is the most neutral pH of the body is key to balancing all other systems lie Digestive systems, immune system, and Respiratory system. Alkaline Water helps by neutralizing the acidic level of the body. People who already have an illness or disease, drinking alkaline water will help them to speed up their recovery.